Ernst & Young published an infographic on Africa by numbers and declared it as having the “fastest growing middle class in the world”. 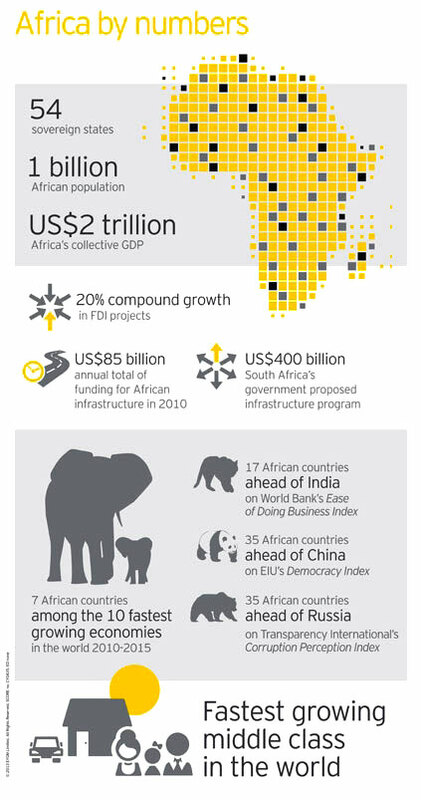 Nested in the infographic are 10 facts that make Africa an attractive region to invest in. Healy Consultants Group PLC agrees: Africa truly is an ideal place for business owners to expand into. Research has shown that the African population spent 35% more on goods and services than the Indian population in 2008. With increasing access to internet and mobile devices, and increased access to education, changes in the population is making it one of the key areas for investment. Two popular jurisdictions for expansion in Africa are: South Africa and Nigeria. (2)	Wholly-owned foreign companies are allowed and legal documents are prepared in English, making it easier for foreigners to set up and conduct business in South Africa. There are also no restrictions on foreign investment. (3)	It is currently the world’s most attractive renewable energy market with US$5.5 billion investment in renewable energy in 2012. This makes it an attractive opportunity for foreign investors. (3)	Nigeria also boasts a rapidly growing business environment and has the highest projected GDP growth in Africa at 7%. The Nigerian stock exchange is also the number one ranked exchange in Africa and physical and industrial infrastructure is a priority for the Nigerian government. To find out more reasons to incorporate in Africa and to read our in-depth guides to company registration in African jurisdictions, visit this page; you can also contact our consultants for a free consultation on African company registration.